Shopping for Avengers Prop Replicas? Agent Phil Coulson would be proud. Collect the Vintage Captain America Trading Card Set from The Avengers! Includes a bloody set and a "near mint" set - a total of 24 cards! Printed from the original digital files from Marvel Studios. 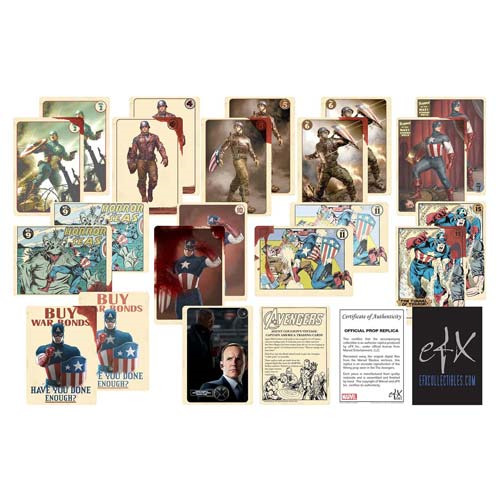 Get the Vintage Captain America Trading Card Set from the movie The Avengers for your very own! This tremendous item is printed from the original digital files from Marvel Studios and features both a bloody and a "near mint" version of the trading cards - a total of 24 cards. The high-quality prop-replica trading card set includes a certificate-of-authenticity card and a prop story card. Phil Coulson would be proud. Printed in the USA. Trading cards measure 3 1/2-inches tall x 2 1/2-inches wide. S.H.I.E.L.D. Agent Phil Coulson took pride in his complete set of Captain America trading cards. It took him years to collect, and when Steve Rogers was awakened from the ice, he was hoping to get them signed. As Coulson loved to tout, "They're vintage and near mint." Then Nick Fury used the bloodstained cards to give the Avengers "a little push" to assemble.